1) You will need to build a base with a 15cm THICK concrete slab for the oven to sit on. This base will help to carry the weight of the oven, raise it to an operational cooking level and the thick floor will help to insulate the oven. The slab should contain NO metal re-enforcement, this is critical because metal will expand and contract at a different rate to the concrete and could cause the slab to fail and collapse. We recommend pouring concrete onto a platform of slabs or blocks laid on concrete lintels. 2) The base should be built to a HEIGHT of 104cm from the floor. This is an approximate height that we recommend, though it is not essential. The height should be built to suit your personal operational preference. If you follow the above dimensions once the 6cm-oven cooking floor is added to your base, the oven will sit at a working height of 110cm from floor level. This is considered optimum for an operator of about 170/175cm tall. Once again this height is NOT ESSENTIAL and can be adjusted to your personal preference, however the base top MUST be a 15cm thick concrete slab. 3) The MINIMUM SURFACE area requirements for the base are 40cm larger than the diameter of the cooking floor of your oven. Please see below for more information about your specific oven size. The surface area information provided applies to both the ORIGINALE and MODERNO ranges. A square base built for an 80cm cooking floor diameter, would need to be 120cm x 120cm. A circular base built for an 80cm cooking floor diameter would need to be 120cm diameter. A square base built for a 100cm cooking floor diameter, would need to be 140cm x 140cm. A circular base built for a 100cm cooking floor diameter would need to be 140cm diameter. A square base built for a 120cm cooking floor diameter, would need to be 160cm x 160cm. A circular base built for a 120cm cooking floor diameter would need to be 160cm diameter. 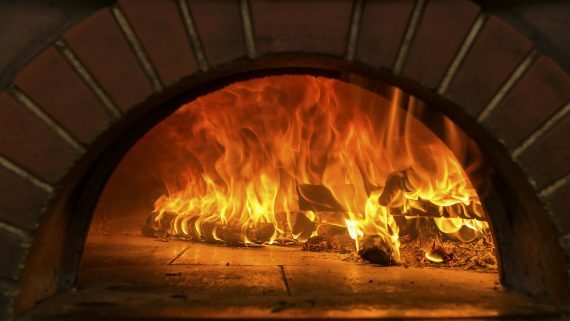 The above dimensions will support the overall dimensions of the oven and the insulation required. You need to add to this enough surface area to carry your oven housing and any side tables, shelves or work surface you desire around the oven. It is essential to consider in addition to the minimum base size the thickness of the outside finishing wall of your housing. There are some examples for you on the following page. 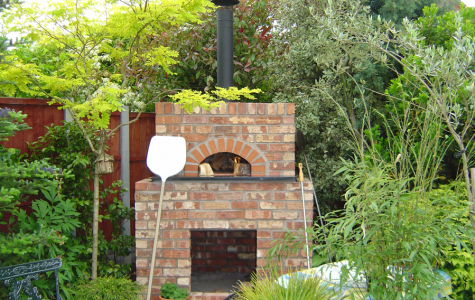 Example 1: a “dovecote style” dome housing to follow the oven shape is usually a 10-15mm thick render, so that must be added to the minimum floor measurement. Please note this does NOT allow for any shelving or extra carrying surface you may require. IMPORTANT NOTE: please ensure that any timber used in the construction of your base or housing is kept at least 15cm away from the oven and the flue pipe. 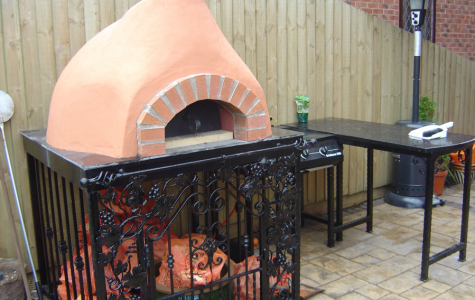 We also recommend all timber used is lined with a suitable fireboard for additional protection.